In a meeting with Amateur Photographer magazine the government has once again attempted to reassure photographers that they are not being u2018targetedu2019 by police officers under anti-terrorism stop and search powers. In a meeting with Amateur Photographer magazine the government has once again attempted to reassure photographers that they are not being ?targeted? by police officers under anti-terrorism stop and search powers. Policing and Counter-terrorism Minister David Hanson today urged Amateur Photographer magazine to forward to the Association of Chief Police Officers (ACPO) any cases where, over the next three months, photographers feel they have been unfairly treated by officers who use terrorism legislation to stop them when taking photos in public places. Hanson pledged to keep a ?watching brief? on the situation and indicated that he is keen to draw a line under the issue following widespread media coverage and a mass protest by photographers in Trafalgar Square in January. 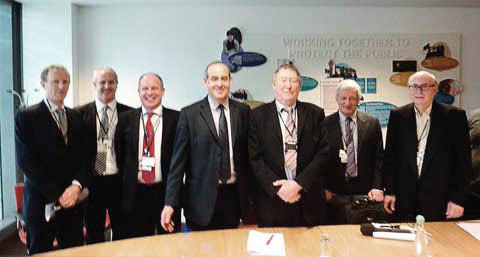 The short-notice meeting with Hanson – held at the Home Office and organised by Austin Mitchell MP – was also attended by senior representatives of ACPO and the Metropolitan Police. Amateur Photographer (AP) was represented by news editor Chris Cheesman and AP Editor Damien Demolder who told Hanson that nothing had changed since a pledge made by Hanson?s predecessor Vernon Coaker a year ago. ?What has changed is a growing problem of people feeling unable to take their camera out of their bag without fear of being stopped. Being approached in the street is quite frightening,’ said Damien. ‘It is also a threat to social/documentary photography.? AP news editor Chris Cheesman relayed photographers’ ongoing concerns that their right to take photographs in public has yet to be sufficiently communicated to police officers on the ground, despite ACPO, Home Office and Met Police guidelines. He also pointed out that, since police were told to scale back their use of Section 44 of the Terrorism Act, cases have arisen where, for example, one officer instead accused a photographer of ‘antisocial’ behaviour and another had wrongly quoted Section 43 (which should only be used when police ‘reasonably suspect’ a person to be a terrorist). The AP pair were the only photography journalists to be invited to the meeting. Austin Mitchell, who described the meeting as constructive, called for a ?strengthening? of the ACPO and Home Office guidelines that were issued last year. He told the minister: ?We think it’s appropriate to strengthen these circulars to assert the fact that photography is a right. Photographers need to feel confident and not inhibited. The circular could emphasise that.? Mitchell also urged the Home Office to improve the training of Police Community Support Officers who many photographers have reported as the predominant abusers of anti-terror laws. During the hour-long talks the Met revealed plans to launch a three-hour training video for its officers on the use of controversial anti-terror police powers, including Section 44 of the Terrorism Act. This training is expected to be available ?within a month?, said Detective Chief Superintendent Michael McDonagh. Meanwhile, ACPO?s spokesman on stop and search Craig Mackey stressed that police do not have any right to specifically target photographers under Section 44. ?Somehow this belief developed that we could engage with people taking photographs. There is no power to do that under Section 44,? said Mackey who repeated the Met?s recently stated aim for a ?common sense style of policing?. Photographers’ interests were also represented by the Royal Photographic Society, the Bureau of Freelance Photographers and freelance photographer Andrew Stuart. Afterwards Damien described the meeting as positive and welcomed the attendance of senior police officers. Last week the government?s terrorism watchdog, Lord Carlile, confirmed to Amateur Photographer that he has called for Section 44 of the Terrorism Act ‘to be ?repealed?. A full report on this afternoon’s Home Office meeting will appear shortly?